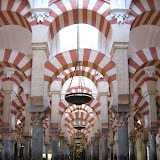 As promised, I have a couple of new slideshows to share, from my recent trip to Spain. 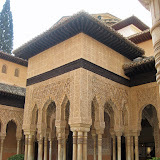 Though we didn’t get as far south as Malaga, where Robert spends the early chapters of The Shattered Crown, I did spend a few days in Granada, the capital city of the last Moorish kingdom in Spain. Granada is a fascinating blend of medieval Muslim and Christian architecture, tiny cobbled lanes and busy modern avenues, and, towering high on the hills above the city, stand the reddish fortification walls of the Alhambra, a sprawling complex of gardens, palaces, churches, and fortress that commands a spectacular view of the rugged countryside around the city. I was lucky enough to stay in a hotel located in a historic building–a 15th-century Moorish merchant’s house, a two-story complex of rooms constructed around three inner courtyards–giving me another chance to glimpse a bit of life in a long-ago age. 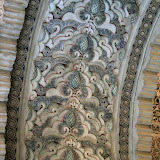 Like many Moorish houses, the exterior of the hotel was a blank plastered wall facing onto a steep, extremely narrow cobbled alley, with only a single large, iron-barred oak door set in the wall. Inside, however, it was an oasis of gracious living–the courtyards provided light and air to the rooms opening out into them, with gently splashing fountains and potted plants set on the cobbled pavement.